As publishers and retailers, it is a great privilege to work with God’s Word on a daily basis. Indeed, at Crossway, we view the Scriptures as central to everything we do. Our publishing agenda, corporate structure and ministry commitments all flow from the foundational truths of the Bible. There is nothing we take more seriously than our responsibility to publish and distribute God’s Word. It is a tremendous privilege to partner with retailers in this important work. Store owners, managers and associates all play a strategic role in the ministry of resourcing the church. We’re committed to our relationships with retailers and view those partnerships as critical opportunities for getting Bibles into the hands of men, women and children across the country. Whether publishing a Bible translation such as our English Standard Version (ESV) or selling Bibles in a physical store, we share a common goal: the distribution of God’s Word. As we look for ways to build Bible sales, two key questions stand out: What are the latest trends in the Bible market? And how can retailers better connect compelling Scripture editions with readers? At Crossway, we receive significant feedback and suggestions regarding our Bibles, from which we can make some general observations about trends that also impact Christian retail sales. Four areas of the Bible market are demonstrating strong momentum: the continued importance of good study Bibles; quality production materials and beautiful cover designs; innovative, text-only editions; and increased interest in journaling Bibles. 1. Study editions. Study Bibles can be a one-stop shop for customers looking for resources to help them better understand God’s Word. A good study Bible will include biblically faithful, well-written study notes; book introductions; articles; and other features that encourage the user to interact with Scripture in a thoughtful way. The compelling nature of such resources is reflected in the continued strength of study Bible sales. Customers often approach the decision to buy a new study Bible with significant care and consideration, viewing it as a long-term purchase. Christian retailers can help customers with this decision by making it easy to find study Bibles in the store and through signage designed to communicate the strengths and features of each edition. 2. Design and quality. 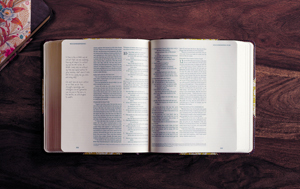 The market is seeing increased demand for well-crafted and beautifully designed Bible editions. At Crossway, we put a lot of thought into the form factor of our Bibles. Our goal is to create beautiful, durable and usable Bibles that will withstand years of regular reading. Customers are increasingly knowledgeable about what makes a quality Bible and take care in their purchase. Retailers can help draw attention to Bibles that feature sewn bindings, high-quality paper, leather covers or lifetime warranties. To better answer questions and offer helpful suggestions, store managers and sales associates may want to educate themselves on the range of Bible production processes and materials. 3. Specific use. We have seen positive response to innovative Bible editions designed for a specific use. Bibles optimized for extended reading, verse-by-verse and large-print Bibles designed for preaching, and Bibles with wide margins have resonated with consumers in recent years. Retailers can educate customers as to the variety of innovative Bible editions they carry and suggest options for customers’ consideration. Grouping Bibles by use or function within a translation also can help customers discover the edition that’s right for their needs. 4. Journaling Bibles. Perhaps the most significant trend in recent months has been the increased interest in journaling Bibles. As the publisher of the original ESV Journaling Bible, Crossway has seen higher demand for these editions, and we are planning the publication of several new editions optimized for Bible journaling. Customers are using journaling Bibles in two primary ways. First, many use them to record sermon notes, personal thoughts and prayers—a trend supported by the role of journaling in the recent, popular film War Room. Secondly, we have witnessed a rise in Bible art journaling, which incorporates illustrations and other “illumination” techniques to highlight specific passages of the Bible. Individuals such as Shanna Noel, Jann Gray and others are at the forefront of this highly social trend and regularly host community groups and workshops that teach men and women methods for creating art in their Bibles. Retailers can respond to this trend by ensuring that journaling Bibles are prominently displayed and merchandised in their stores. They may also want to consider hosting journaling workshops to engage with this growing audience. How can retailers help customers make sense of all of the available translations and editions? Retailers should consider three factors: the placement of Bibles in their stores, how those Bibles are organized and the knowledge base of their staff. The placement of the Bible section in a store can send a message to the customer. Is it easy to find? Does its placement on the floor and layout appropriately communicate the foundational importance of God’s Word? While most retailers have limited space to display Bibles, these are important questions to consider. Given the wide variety of Bibles most stores carry, there are a number of different ways stores can organize their Bible shelves. Recent research from Nielsen BookScan suggests that translation is often the primary determining factor in customer choice, taking precedence over other factors such as features or price. Many customers prefer a specific translation, meaning that retailers may want to organize Bibles by translation. Distinct translation sections coupled with clear signage that explains the differences between the translations will make it easier for customers to quickly find the Bible they’re looking for on the shelves. Within a translation section, retailers can order the Bibles in broad categories. For example, some customers want a Bible with larger print but are less interested in other features. Some customers will be shopping for someone else, and a special selection of suggested gift editions could serve them well. As stores consider the best way to organize their Bibles, managers and associates should pay attention to the questions customers ask and periodically consider ways to more intuitively organize Bibles to meet their customers’ needs. Point-of-purchase displays and Bible merchandising in other parts of the store also can be great ways to draw a customer’s attention to popular Bibles, gift editions and Bibles that transition between categories. For example, stores could place inexpensive gift Bibles at the register or add a display of journaling Bibles in their journal section. Brick-and-mortar stores have the opportunity to offer customers a more personal, guided browsing experience—something difficult to replicate online. As much as possible, customers should have in-store access to the interior of each Bible edition. If a certain edition comes in sealed packaging, retailers should consider making a display copy available. Space permitting, stores can create dedicated tables or displays that enable customers to easily compare Bible editions. These can be great places for associates to engage customers and answer their questions. Perhaps the most important resource stores can provide to customers looking to purchase a Bible is a knowledgeable and engaging staff. Most customers won’t have time to exhaustively survey all of a store’s Scripture offerings, and many will have questions about the differences between translations and other features. Unlike online outlets, physical stores can provide answers to customers’ questions in an immediate, face-to-face way. Christian retailers might want to consider training courses from Bible publishers designed to help store staff understand the basics of Bible translations and production materials. They can also encourage sales associates to familiarize themselves with the interiors and features of each Bible edition their store carries. Andrew Tebbe is vice president of marketing and communications at Crossway.